There are many delicious regional styles of preparing barbecue. There are many different kinds of barbecue. There are a variety of ways of preparing it. Barbecue is central to U.S. food culture and has its roots in the southern United States. Americans traditionally enjoy cooking meat in this style and gathering together for family dinners to enjoy it. Barbecue consists of slow-cooked or smoked pork or beef. Some people, though, prefer the variety of delicious side dishes, which can include mac n' cheese, baked beans, corn on the cob, coleslaw, potato salad, and cornbread. Barbecued meat is usually smoked over a long period of time over wood or charcoal, which is very different from traditional grilling. While barbecuing traditionally takes place outside, some barbecue restaurants will smoke their meat in specially-designed brick or metal ovens to accommodate the large quantity of food. The rubs and sauces used to cook these meats varies. Some barbecue sauce will be vinegar based, while others use mustard, tomato, or ketchup as a base for the sauce. Lots of different spices (like paprika or cumin) and different kinds of wood (like hickory) can be used to give the meats distinct flavors. Barbecue varieties also differ by region: for example, North Carolina barbecue is different from Kansas City barbecue, which can differ from barbecue styles popular in Texas. This style of barbecue varies across the state, but pulled pork (shredded, barbecued pork from an entire pig) with a thin, vinegar-based sauce tends to dominate. In the western part of the state, however, you will likely find pork shoulder served with tomato barbecue sauce. Considered the barbecue capital of the Midwest, Kansas City has a strong barbecue tradition. Both pork and beef varieties are popular, burnt ends in particular– the charred ends of the slab of brisket. They are often mixed in with baked beans to add some flavor and texture. Kansas City barbecue sauce uses mostly tomato as a base and tends to be thicker and more similar to what you might find for barbecue sauces in a grocery store. Molasses is an ingredient used to give the tangy sauce some sweetness. Kansas City is famous in the U.S. for its many phenomenal barbecue restaurants. Memphis, Tennessee is another city famous for its multiude of barbecue styles. Pork ribs are a specialty and can either be served dry (rubbed with spices) or wet (slathered in sauce before, during, and after barbecuing). A rack of ribs makes for a messy but tasty American barbecue meal. The pulled pork sandwich can be found across the U.S., but is especially popular in Memphis: pulled pork shoulder on a bun with some coleslaw on top. Here you will also find a variety of delicious barbecue options, especially beef, such as beef brisket and beef ribs. Texas barbecue tends to be dry, with sauce sometimes served on the side, and use mesquite to give the beef a distinct taste. And it doesn't stop there: South Carolina, Kentucky, Chicago, and other areas have their own regional variations of barbecue. 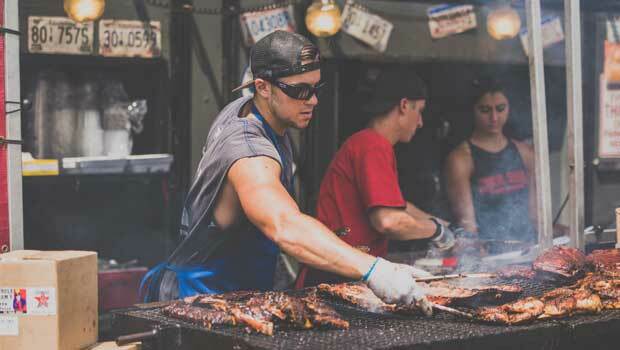 If you're traveling across the United States, be sure to catch one of many barbecue festivals and competitions where the best "pitmasters" compete to serve the tastiest 'cue. Check out some of the top BBQ festivals and competitions around the country. Dinosaur Bar-B-Que: With locations in Harlem and Brooklyn (the original is based in Syracuse, New York), Dinosaur serves up some great barbecue, especially their ribs and pulled pork. There is waiter service and a bar area if the wait at the restaurant is too long. You can also buy their famous barbecue sauce at the grocery store. Hill Country BBQ: This place is an InterExchange staff favorite! It's more of a cafeteria-style restaurant, and the meat is served by weight. Don't forget to get some sides to share, like the mac n' cheese or corn pudding. Don't forget to save room for dessert! Hill Country has outposts in Manhattan and Brooklyn. Mighty Quinn's: This casual barbecue joint serves up some incredible brisket, with just the right amount of salt flaked on top. Their pickled veggies and beer selection make nice accompaniments to your meal as well. The line is worth the wait! You can also check out this list of the top barbecue spots in the U.S. If you're near any of these, give them a try, and let us know your favorites! Happy eating!